For all of 2012, Louisiana Baptists and other Christian churches have been emphasizing the need for a spiritual awakening for our state. This came about when we realized that Louisiana has never really been touched by the four great spiritual awakenings in our country. You can find information about the first two spiritual awakenings in our country and their effects here and here. All you have to do is look at the condition of the state, nation, and world to realize that without God we are in trouble. The world has always been that way. Jesus came to deal with the problem of our sin. Why is it that things are worse now than they have ever been? Why is it that the world will deteriorate in the last days before Christ returns? Maybe the answer is the accumulation of sin over the thousands of years since the rebellion of Adam and Eve. Fortunately, God did for us what we could not do for ourselves. He sent His Son and bestowed His Spirit. We truly need to pray for God to do what only He can. We need spiritual awakening. I want to challenge you to pray. Wherever you live, you can pray for the spiritual well-being of your community. The State of Louisiana has asked for a wave of prayer over our state as people gather at the courthouses in each parish to pray. In St. Tammany Parish, Louisiana, where I reside, we will meet Tuesday, April 3 at 4:00 PM on the north steps of the courthouse (near the memorial flags) to pray. This will happen all over the state. We have already seen effects of our prayer. I can identify four marriages that God is in process of putting back together. This past Sunday we essentially had a man walk in off the street and confess his faith in Christ. These are the kinds of things that God does because we cast all of our cares on Him. As we confess our sin and seek His face, we experience the blessing of God that sweeps over our lives and our communities. Please pray for God to move among His people. Just as it is with Salvation, it is a both an act and a process to recognize our Purpose. What does that mean: Why, being the Light with Him shining through us under the Direction of the Holy Spirit, Empowered by God the Father. So, I’ve asked, I’ve received, and I’ve tithed (often sacrificially); I’ve even gone on a few mission trips, put myself in harms way and led ministries of Scripture distribution & building: medical, educational, and worship facilities domestically over seas. Isn’t that enough? No? Serving as a Deacon, being ordained, teaching Sunday School, witnessing door to door and even in the streets of Jerusalem isn’t enough? No? Leaving the church of my father and mother, going to seminary abandoning my career, authoring new ministries, preaching, isn’t that enough? No? Supporting the ministries in my family with the money and time you provided through the sweat of my brow Lord, having my savings and the wealth of generations ripped away by being faithful to Your Instruction isn’t enough? No? What more do You ask? Are not the Father and I One, I hear. Have you not been provided with the Holy Spirit to lead you with the Traveler’s Map, the Pilot’s Compass, the Soldier’s Sword and the Christian’s Charter found in My Word, I hear. Many have been Called, yet few have realized the magnitude of their Calling; Will you, I hear. May we fuel revival with Truth not lies and Prayers to facilitate Thy Kingdom Come, Thy Will be Done in the recognition of the necessity of the (Saints) many parts of the Body/Bride’s interdependence being realized. AMEN. Amen. 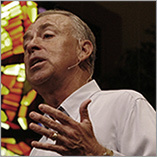 just issued the challenge to our congregation today to use the “Awaken 2012” prayer guide claude king developed for the LBC. praying that we will see a great awakening by easter!